Doug A. Peebles, Esquire came to us with an outdated website that was not mobile friendly. He also needed a rebranding in both design and how his area of practice was presented. Mr. Peebles practices construction law so we focused everything on his site on construction law from the domain, to key words and to imagery. For the branding we made an anagram with the initials of his practice, ‘PLF’. This contrasted the scholarly timeless letters of Sabon for the logotype ‘Peebles Law Firm’. We took his content and made it visually interesting by using pull quotes, larger colored text, text on colored background, subtle background images under text, and lists with icons. Imagery of construction are seen fading into text to break up the page. Call to actions are prominent and well placed. This site uses animations introduced into our theme last year. 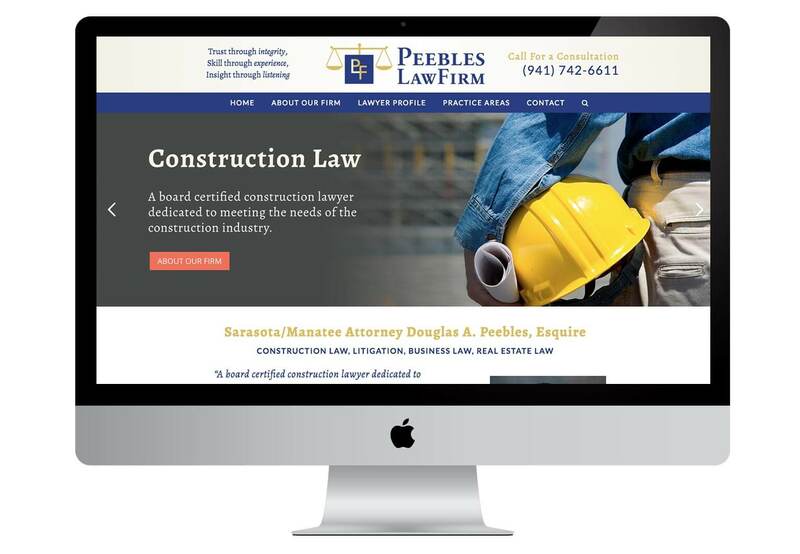 peeblesconstructionlaw.com has all the ‘bells and whistles’ but still looks sophisticated.